Anyone can become a member; THE 'CLAN' PROJECT offers a choice of membership options to provide a membership package for every age and every pocket. The Annual Membership option runs from 1st January to 31st December in any membership year - renewal reminders being sent out with the November edition of 'Clan News' - and attracts a 'Certificate of Membership' on first application and an Annual Membership Card. There are also Life Membership packages available to suit Adults, Seniors and couples; please refer to the full range of membership options available below. Membership brings with it certain benefits, not least, two editions of our house magazine, 'Clan News', per year (May & November), the right to vote at our Annual General Meeting (not Juniors) and the opportunity to get involved with the project through working parties, the sales team, members' forums etc. We are currently developing a Members Only area which will enable you to access breaking news and the latest developments before they are released to the public. If you are able to bring any experience or useful skills to the project, please let us know - the building of a brand new Class 6MT steam locomotive utilises a range of skills from administration and sales through to heavy engineering and, if you can fill any gap, you will be most welcome. To apply, simply download and print the Membership Multiform below and complete the relevant sections, sign and forward, along with your payment to the address on the form. Membership (except Life) renewal will fall due on 1st day of January every year and completed renewal forms and fees MUST be submitted to the Company by not later than 31st January in the applicable membership year. The Membership Secretary, Mr. Allan Jones, THE 'CLAN' PROJECT, 31 Jackdaw Lane, Droitwich Spa, Worcestershire WR9 7HE. Please make cheques and Postal Orders out to 'THE STANDARD STEAM LOCOMOTIVE COMPANY LTD'. Remember to include all your details, address, post code, e-mail address and/or telephone contact number. If you are a UK taxpayer, please remember to complete the 'Gift Aid' section of the Multiform to allow us to reclaim the tax applicable to your Membership Fee. In the event of your annual renewal form becoming lost, damaged or spoiled, please download another copy above here. The membership system for the Clan Project is electronically based and does not use paper records. As such, we will store your personal details on a secure IT system. The Standard Steam Locomotive Company Limited is the data controller. Membership data is currently stored in a password protected Excel spreadsheet. Data is backed up to a secure system hosted by a third party commercial web hosting service. Personal data can only be accessed by administrators with the correct access privilege and using their username and password. We may change to a secure, online membership system in the future. 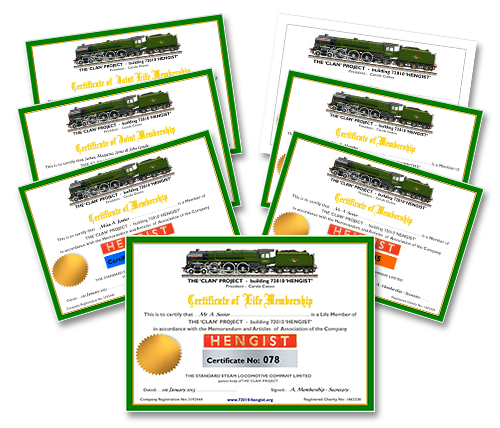 We use your personal data solely for the purposes of informing you about Standard Steam Locomotive Company Limited activities and for managing your membership records. We mainly use postal mail for all communications although we may use e-mail more in the future for those members who record a preference for e-mail communication. We do not exchange your personal data with any other person or organisation. You can access all of the information we hold on by contacting the membership secretary. If we move to an online system, you will be able to inspect all of the data we hold on you. You can ask us to delete your records at any time. If you are a member of the Standard Steam Locomotive Company Limited, we will have to cancel your membership as our membership system is electronically based. If your membership lapses, then we will retain your records for 3 years, unless you ask us to delete them. After that period, they will be deleted.